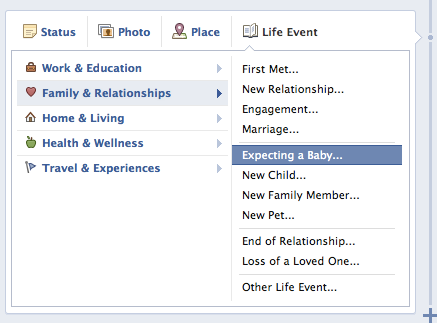 Facebook has a Timeline feature that allows users to document a major life event: Expecting a child. This life event also gives users the option to “tag” the other parent, set when the announcement goes live and even include a story or comments. While it may be interesting and fun for friends and family to share in such personal news, what does it mean for the millions of businesses that are reaching out to potential customers via Facebook? It doesn’t end there! 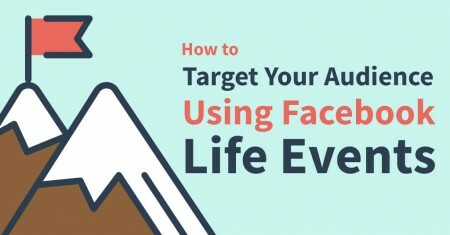 Facebook also allows you to target other life events such as relationships, new jobs, anniversaries, upcoming birthdays or if people are currently away from their hometown. Now that you know that these targeting options are possibilities, you can begin thinking of your own business. Invite your customers to celebrate their upcoming anniversary at your hotel and offer discounts. If your business is a jewelry store, target upcoming birthdays to women so they can tag their significant others as a hint for what to get them for their birthdays. There are endless possibilities! Next, make good use of Facebook Insights so that you as a business owner can analyze the demographics of who is interacting with their Facebook pages based on age, location and language. As Social Media users begin to record more personal information on Facebook, business owners can now create Ads that are more specific to their consumers’ interests and needs. But the added category of “Expecting a Baby” on Facebook means that niche companies selling baby supplies, maternity clothes or parent classes, for example, can hone in on parents-to-be and avoid wasted advertising. The options to the right can be found using Facebook’s Audience Insights tool where you can create a more specific target audience for your ads. You have the option of targeting certain interests and or behaviors. Narrowing down your business’ demographic really is one of the most important ways to ensure success in online marketing, and Facebook is only making it easier to expand your viral reach. For instance if a furniture store just started carrying a collection of toddler beds, they could create a Facebook ad targeted toward “Parents (child: 0-3 years)” because that demographic is more likely to be interested in children’s furniture than any other. With Facebook, the furniture store can now easily tap into a very specific portion within a larger demographic. However, it’s not as simple as just clicking a check box and hoping for the best. Facebook ads combine visuals and text, and both must be fully optimized for reaching your demographic. Launching an ad that simply reads “Quality Furniture at Affordable Prices” with hard-to-see image of a cradle won’t appeal to expecting parents looking to purchase an affordable, high-quality baby cradle. An effective online marketing ad campaign requires plenty of research, from identifying target keywords, to analyzing competitors to studying your core audience. As of late 2015, there were more than 2.5 million advertisers on Facebook! It’s an incredible opportunity to find the right customers for your business but it’s also becoming more competitive. At Ready Artwork, we’ve built up our Facebook advertising expertise. We understand that Social Media Advertising is becoming more competitive as more companies begin to discover it. We stay informed with the latest changes and discover new opportunities. For more insight into social media marketing and how Facebook advertising can improve your business’s online presence (and increase your ROI) call us today or schedule an appointment to stop by our studio in Monrovia, California! We’re always happy to work with businesses of all sizes to help them reach their goals!